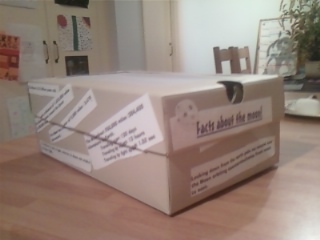 at the weekend my 10 year old and I finally finished a long planned 'moon' project. 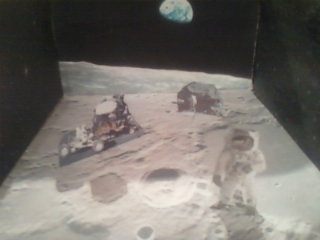 The brief was that it had to be 'something about the moon or space or the stars, with facts.' 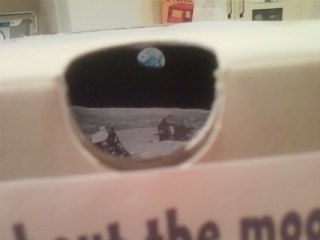 Previous entries had included papier mache moons, model space craft, plans of stars etc. Well I can take credit for the idea and minimal assistance with the sticking. Daughter was in charge of planning, picture choice, cutting and placement. Also the facts were all researched, selected and printed etc by her. The results are below. It is the first project where we both learned stuff, we both had fun, and we are both proud of the finished product!